A composite depiction of a few photographs of Chicago—an orange-colored tree off the I-90/94 and the view of the city skyline from the artist’s studio—the limited-edition “Chicago in Fall” represents oil painter Ryan Kapp’s first foray into silk screening. $65 at beholder-art.com . 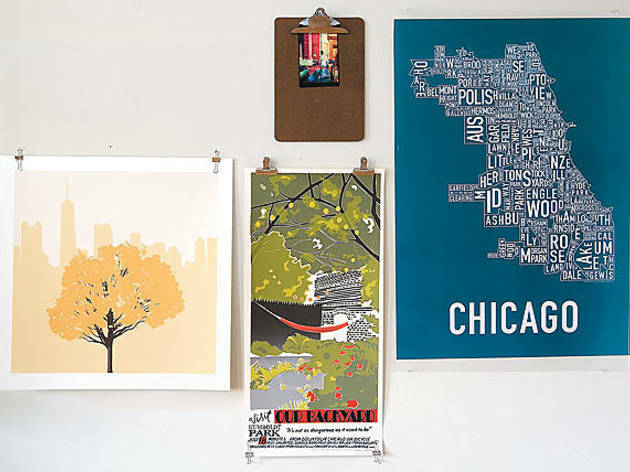 Chicago-based graphic designer Jenny Beorkrem’s screenprinted, typographic neighborhood poster defines the city by enclave. 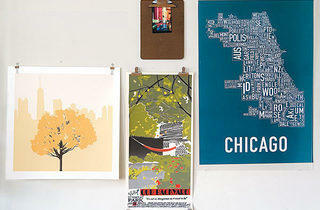 The Ork posters are printed with soy-based ink in red, blue and black versions on recycled paper. Other versions depict urban hot spots like San Francisco, Brooklyn and Boston. $22 at orkposters.com.